A drinking game of chance! Every player chooses a coloured shot glass and matching playing chip. Fill each shot glass evenly with your chosen alcohol, then each player must choose a slot for their glass at the bottom of the game board. Once a player chooses a slot they must remain there until the end of the round. Players then take it in turns dropping their chips anywhere along the top opening of the game board and watch it fall. Whichever player occupies the slot where the chip lands must drink their shot and refill the glass to resume play. If you manage to get your chip in your own glass, you get a pass and everyone else must take their shot! LAST MAN STANDING WINS THE GAME Game includes six shot glasses, six playing chips, and SHOT FALLS playing board. Intended for six players ages 18 and up.Every player chooses a coloured shot glass and matching playing chip. Fill each shot glass evenly with your chosen alcohol, then each player must choose a slot for their glass at the bottom of the game board. Once a player chooses a slot they must remain there until the end of the round. Players then take it in turns dropping their chips anywhere along the top opening of the game board and watch it fall. Whichever player occupies the slot where the chip lands must drink their shot and refill the glass to resume play. 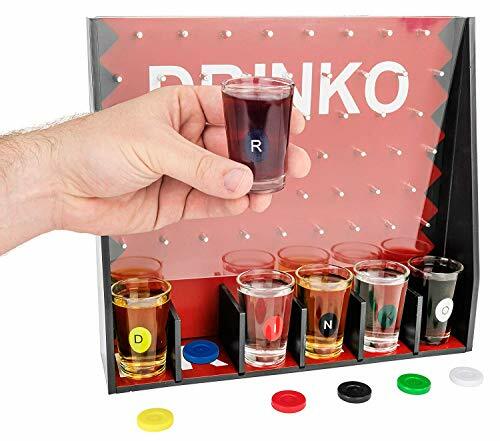 Game includes six shot glasses, six playing chips, and SHOT FALLS playing board.